Does all this online talking matter if nothing comes of it in the real world? Connecting and conversing is necessary, but again, the danger is that we get stuck in conversation. There is such a thing as being too connected. We have cognitive and time limits. Web 2.0 can overload us with messages, shrink attention spans, absorb our time, erode focus, and thus disrupt our ability as citizens to find common ground and take action together. It’s possible that through Web 2.0 we may be, as in the title of cultural critic Neil Postman’s influential book, amusing ourselves to death. How do we make something happen? What are small things we can start doing to get the hang of real coordination, collaboration, and action? I’m all for starting with something small but nonetheless tangible – to give us something to build on and learn from. Why not shoot first, and aim later? The worst that can happen is we fail fast and learn from our mistakes. With that goal in mind, I’m fascinated by an initiative by my Carnegie Mellon University colleague Priya Narasimhan (@priyacmu) to use crowdsourcing and social media to help locate, assess & repair potholes around Pittsburgh [see news story w/ video]. 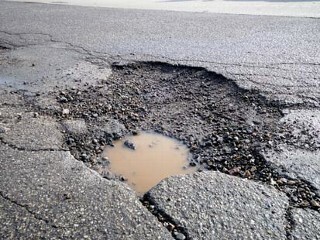 Pittsburghers are given three options for reporting potholes – dial 311 on their mobile phone, log it at the website pittsburghpothole.com, or best of all, report it using a free iPhone app called iBurgh. This is exciting for me partly because it is being done by a friend. But more importantly, it illustrates something we saw emerging with the DARPA Red Balloon Challenge which might be called crowdsensing – using a distributed network of tech-enabled individuals to track and report on significant (and sometimes not-so-significant) events happening in their world. Another nice example is the Twitter Earthquake Detection Program, which encourages people to report when the earth moves via Twitter or on a dedicated “Did You Feel It?” website. I’m hopeful an even bigger and better example will happen soon in the form of a regime change in Iran, thanks in part to Twitter. As I observed recently, Twitter has given the citizens of Iran a way to tell the story of their quest for freedom to the world in real-time and in a way that engages public interest, at a time when traditional media channels have been locked out by their oppressive government. I wish them the best of luck, and will be tracking the events on Twitter as they unfold. When (not if) they succeed, it will be an important milestone for the emerging Global Brain.